Run swiftly through the moonlit fields of Rokugan. Ride your dragon across the Seven Kingdoms. Traverse the battlefields of Terrinoth, raising the dead and adding them to your army. Time is short, and you have places you need to be… The 2018 November World Championships are fast approaching! 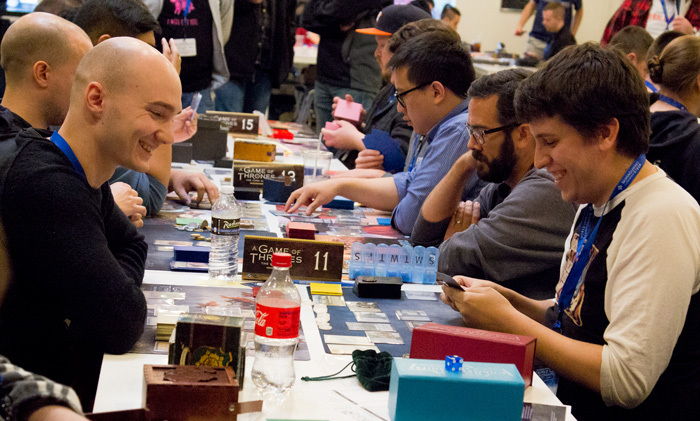 The pinnacle of Organized Play for these games, the 2018 November World Championships offer top-level competition, camaraderie, and excitement. Each year, we see new legends forged. We see new decks and armies transform the meta. We follow new stories. And we reveal some of the year's most coveted prizes—including The Greatest Prize in Gaming, the chance to work with your game's developers to inspire the design of a future card. Registration opens September 8th, and the weekend's event schedules are available for download. So call up your carpool buddies, check on airfare, claim your reserved seats, set your alarm for the September 8th registration, and start making your plans. Registration for the 2018 Runewars Miniatures Game World Championship opens Saturday, September 8th at 12:00 PM. Registration for the 2018 A Game of Thrones: The Card Game World Championship opens Saturday, September 8th at 1:00 PM. Registration for the 2018 Legend of the Five Rings: The Card Game World Championship opens Saturday, September 8th at 2:00 PM. All listed times are CDT (UTC-0500). For now, you can find more information about registration alongside the World Championship details for your favorite game in the sections below. We look forward to seeing you in November! Here, you will find step-by-step application instructions, a World Championships application timeline, and several important notes about your application and registration. Regional Champions, National Champions, North American Champions, European Champions, Hatamotos, Kotei Qualifiers, World Champions, and other players with reserved seats should use this form. Submissions due September 9th, 2018 by 11:59 PM CDT. 1) General registrants (without reserved seats) should use this ticketing portal. Registration is $75. Registration for the 2018 A Game of Thrones: The Card Game World Championship opens at 1:00 PM CDT (UTC-0500) on Saturday, September 8th. Registration for the 2018 Legend of the Five Rings: The Card Game World Championship opens at 2:00 PM CDT (UTC-0500) on Saturday, September 8th. Registration for the 2018 Runewars Miniatures Game World Championship opens at 12:00 PM CDT (UTC-0500) on Saturday, September 8th. 3) Registration is $75. If you wish to register for multiple World Championship tournaments, you must register for each World Championship tournament separately. 4) If your World Championship event features multiple Day 1 events, you may only register for one of them. 5) Your World Championship ticket gains you access to any and all of the weekend's side events. 6) Registration is first-come / first-served. Seating is limited. 7) Any unclaimed reserved seats will be made available to the public on October 1st at 12:00 PM CDT. These will also be first-come / first-served. 8) All registration will be complete by October 1st. There is no waitlist or on-site registration for this event. Media applications are due September 16th by 12:00 PM CDT. August 29 — Pre-qualified players may begin to claim their reserved seats. September 8 — 12:00 PM CDT. 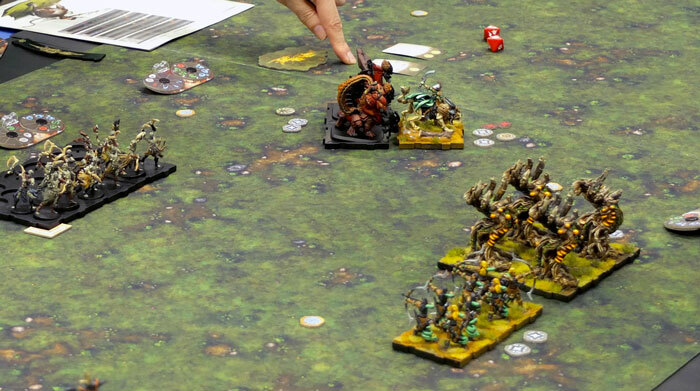 Registration opens for the 2018 Runewars Miniatures Game World Championship. September 8 — 1:00 PM CDT. Registration opens for the 2018 A Game of Thrones: The Card Game World Championship. September 8 — 2:00 PM CDT. 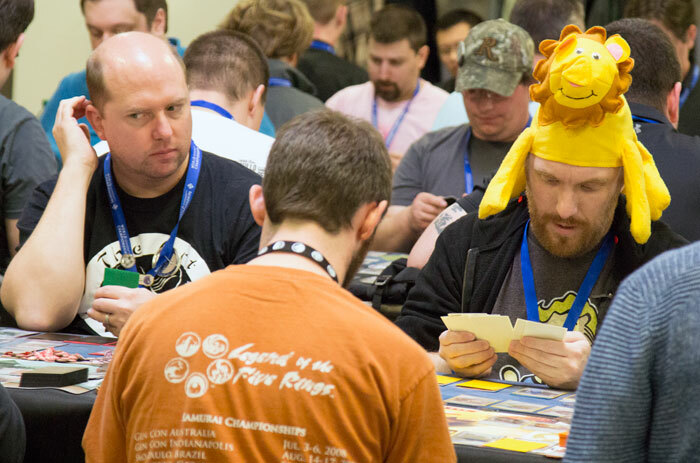 Registration opens for the 2018 Legend of the Five Rings: The Card Game World Championship. September 9 — 11:50 PM CDT Deadline for players with reserved seats to claim them. September 16 — 11:59 PM CDT. Press application deadline. October 1 — 12:00 PM CDT. Any unclaimed reserved seats are made available on a first-come / first-served basis. October 1 — All registration will be complete. There is no waitlist or on-site registration for this event. Tickets and reserved seats are specific to their game (and day). 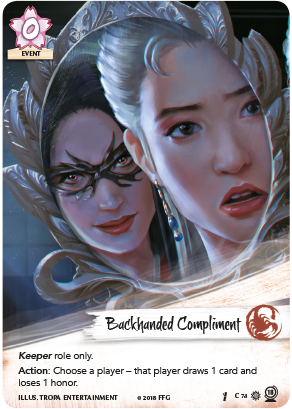 Sharpen your blades and open your eyes—the 2018 Winter Court World Championship for Legend of the Five Rings: The Card Game is being held deep in Scorpion territory. Throughout the year, Scorpion courtiers have insinuated themselves into every aspect of the Imperial court. They have kept the Emperor informed, and their samurai have won countless battles in tournaments around the world. As a result, the Emperor has granted the Scorpions the honor of hosting his Winter Court, and participating samurai will find the Fantasy Flight Games Center draped in the Scorpion clan colors and mon. That doesn't mean, however, that the Scorpion are guaranteed to walk away with the ultimate prize. Every clan is sure to send its greatest champions, and only one of them can be named Shogun at the end of the event. 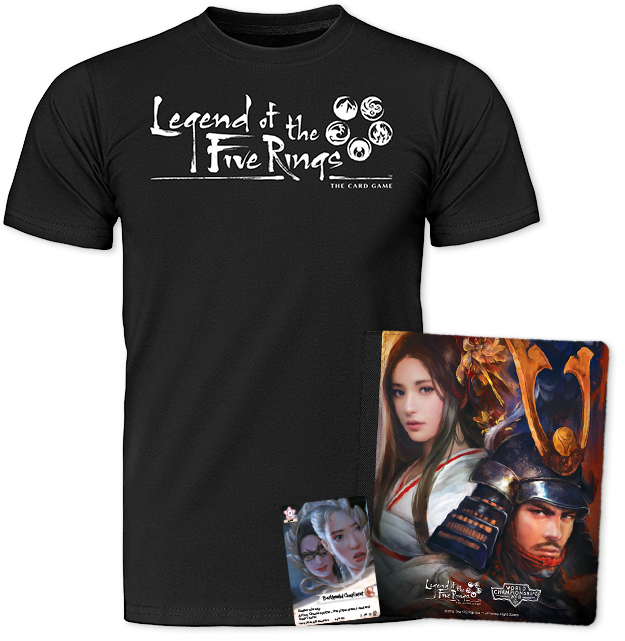 While only one player will claim the title of Shogun, everyone who participates will claim a prize package that includes a Legend of the Five Rings: The Card Game T-shirt, a four-card binder, and an alternate art copy of Backhanded Compliment . You'll sweeten your prizes with each battle you win, and if you can conquer all your fellow samurai to become Shogun, you'll earn the chance to make an important story choice and win The Greatest Prize in Gaming, the chance to work with the game's developers to inspire a future card. Look for more information about the World Championship story choice and prizes in the weeks to come. Of course, since the Emperor's Winter Court isn't entirely a matter of high-stakes conflicts, you can enjoy yourself in some Legend of the Five Rings: The Card Game side events, as well. There's a Hatamoto Challenge and Proving Grounds tournament, and you'll even find a number of Multiplayer Beta Sessions. Start making your plans by downloading the Legend of the Five Rings: The Card Game event schedule (pdf, 157 KB). Then mark your calendar for registration on September 8th at 2:00 PM CDT (UTC-0500). 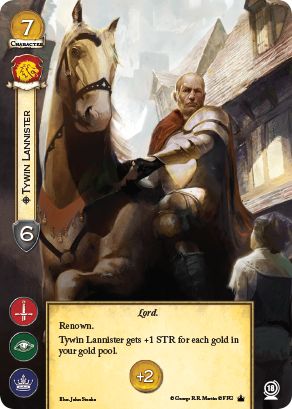 With the approach of the 2018 A Game of Thrones: The Card Game World Championship, the Great Houses of Westeros have their eyes set once more on King's Landing and the Iron Throne. Blood, betrayals, and political battles are sure to follow! Participants will test their mettle against a host of lords, ladies, knights, and faceless assassins. 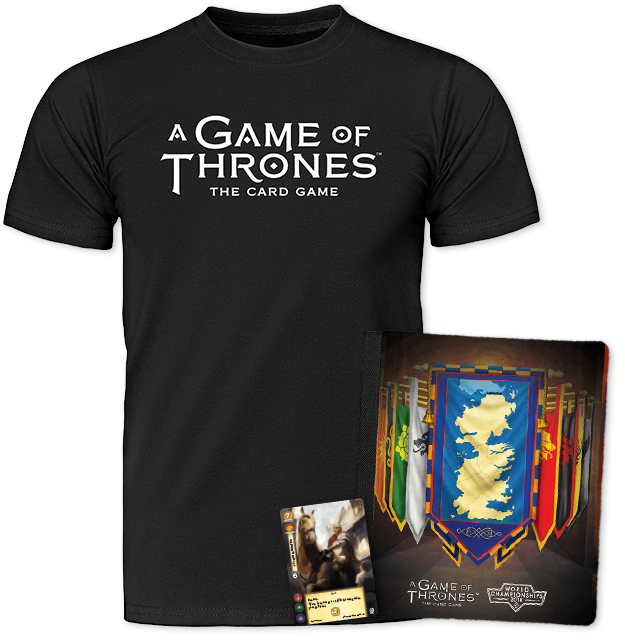 Everyone will claim a set of participation prizes, including a T-shirt, a four-card binder, and an alternate art version of Tywin Lannister that's certain to make you feel rich and powerful. Then, you'll have the opportunity to win other prizes on the field of battle, including The Greatest Prize in Gaming—the World Champion's opportunity to work with the developers to inspire a future card! We'll share more information about these prizes in the coming weeks. World Championship participants will also find plenty of chances to supplement their competitive jousts with some good, old-fashioned melee action. In fact, there are two multiplayer events this year—the ever-surprising Grand Melee and a Kingsmoot variant, which mirrors the melee in pitting four players against each other, but introduces a number of key changes to alter the game's dynamics. Start making your plans to attend the November World Championships. Download the A Game of Thrones: The Card Game event schedule now (pdf, 219 KB), and look for the Kingsmoot rules to become available in the coming weeks. And mark your calendar for registration—September 8th at 1:00 PM CDT (UTC-0500)! Last year, the Latari Elves emerged from their forest shortly before the World Championships and surprised their foes on the field of battle, conquering all. Will they hold fast against their enemies' retaliatory strikes in 2018? Will we see the Uthuk Y'llan—the game's newest faction—batter their rivals with Ynfernael strength and ferocity? Or will we see the noble Daqan Lords or fallen soldiers of Waiqar's undead army rally and seize the day? The hills and forests and valleys of Terrinoth tremble once more with the thunderous footfalls of mounted cavalry. The 2018 World Championships are the pinnacle of Runewars Miniatures Game Organized Play, and only the greatest of commanders will seize the day! But while, ultimately, only one player will remaining standing amid the devastation—while only one player can claim the championship—everyone participating in the 2018 World Championship will walk away richer for their participation. 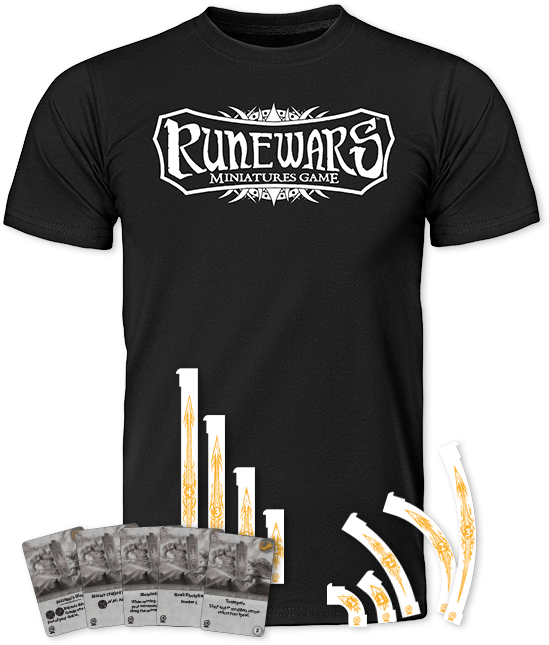 The 2018 Runewars Miniatures Game World Championship participation prizes include a T-shirt, a set of maneuver templates, and extended art cards: Master-Crafted Weapons, Fortuna’s Dice, Metered March, and Trumpets. Throughout the tournament, you'll have the opportunity to claim other prizes, as well, including—if you can rise to the top—The Greatest Prize in Gaming, the chance for the World Champion to work with the game's developers to inspire the design of a future card. We'll have more information about the Runewars Miniatures Game World Championship prizes in the coming weeks. World Championship attendees will also find ways to enjoy Terrinoth outside of the World Championship tournament. A Team Battle promises to deliver new and memorable experiences, and a Painting Contest affords you a chance both to display your best craftwork and to appreciate how other players have interpreted their Runewars armies. Download the Runewars Miniatures Game World Championship event schedule now (pdf, 4.3 MB). Then be sure to set aside time for registration—September 8th at 12:00 PM CDT (UTC-0500). 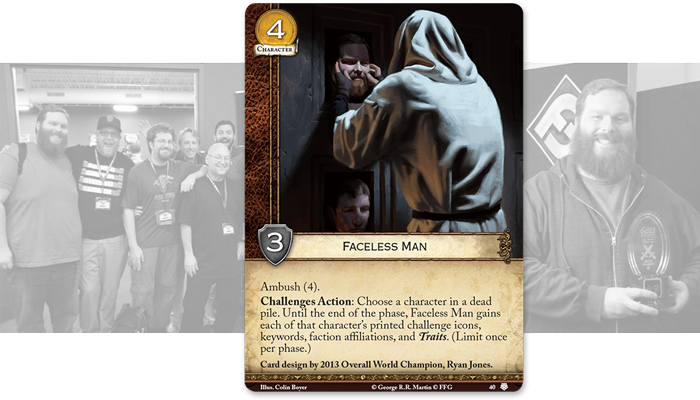 Over the past several years, the November World Championships have seen top-level competition, innovative deck and army designs, and daring tactical gambles. We've seen champions forge their legends. And we've seen thrilling stories of good sportsmanship and camaraderie. What will we see this November? Be sure to keep your eyes open for more Organized Play news as we get ready for all the World Championship action. We'll have a look at the prizes and the story choice the Legend of the Five Rings: The Card Game Shogun will have to make. We'll also take a look at the games' current metagames and delve into some of the information the fans at home might want to know in order to better appreciate the plays they see on Twitch. Don't miss your chance to be a part of the 2018 November World Championships. Claim your reserved seat, or mark your calendar. Registration opens September 8th! This November 1st – 4th, the 2018 November World Championships take place at the Fantasy Flight Games Center in Roseville, MN. 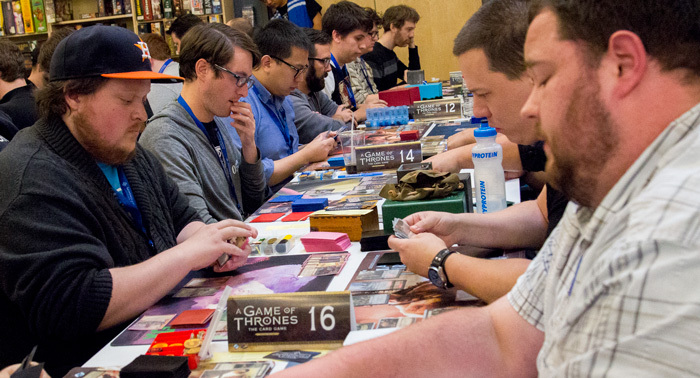 Join the world's best players for A Game of Thrones: The Card Game, Legend of the Five Rings: The Card Game, and Runewars Miniatures Game for a four-day international celebration of gaming!